Every few months, we get together with friends and put together a gourmet dinner, based on a country, or cuisine, chosen by the host. This time around, it was my turn to host, and since my wife and I recently spent a few weeks in Chile (trip recap here), we decided to give Chilean Cuisine a go. Since Chile is located in South America, most people would expect something similar to Mexican food, but you would be wrong. There is a strong influence from traditional Spanish cuisine, but it is mixed with local ingredients, and more importantly, the influences of European cuisines, particularly from Germany, Italy and France. When we traveled to Chile, we experienced fresh fruits and vegetable, an array of seafood and meats. Chile and Peru have a long running argument over who is responsible for the potato. I will stay out of the argument, but will attest to the prevalence of the potato, particularly in the south around Chiloe. In the north, we experienced quinoa in multiple forms, but the most unusual was puffed quinoa. Corn, known as “choclo” was also abundant. With the extended shoreline of Chile, seafood was found everywhere. Salmon farms in the Lake and Patagonia districts are very common. Hake was a particularly common fish in restaurants, but rarely found in my local grocery stores. Lamb cooked on a rack, set up around an open fire pit was a memorable tasting experience. At almost every meal, we were served local “street bread” known as Pan Amasado. I would liken it to hard tack. It was a small, often tasteless roll or biscuit, always indented with the tines of a fork on top. 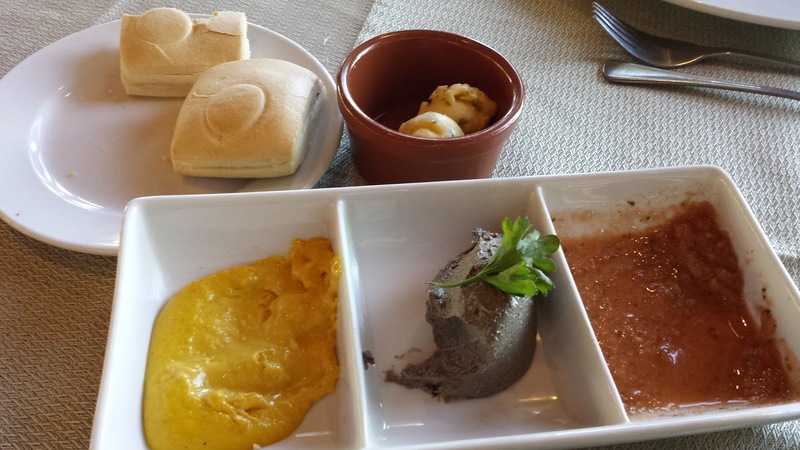 The bread was served with a form of salsa, known as Pebre, and sometimes with as many as three different dipping or spreading sauces. The goal for this dinner was to create a menu that represented the different regions of Chile. We incorporated all the main ingredients and searched for recipes in a number of Chilean cookbooks. In a few cases, the herbs or proteins were not to be found, or required some searching. But, what resulted was one of our better dinner/wine pairing experiences. And, the total cost (including wine) was only $50/person! The first course was an appetizer course of seafood items: Merluza Rellena con Pimientos y Coulis de Ceboletta (Hake filled with Piquillo peppers with scallion coulis); and Salmon ahumado en tazas de pepino (Smoked salmon in cucumber cups). Hake was nowhere to be found, so it was substituted with Talapia. This was a wonderfully light opening dish that was paired with the 2013 Veramonte Sauvignon Blanc. The couple who made this dish smoked their own salmon and were able to source piquillo peppers for the dish. The wine had a crisp acidity to it, with fruit and mineral notes. It was a nice pairing, particularly with the smoked salmon dish. Our second course consisted of a traditional ensalada (salad) course: Ensalada a la Chilena (Tomato and sweet onion salad) along with Humitas de Choclo (Corn tamales). For this course, we paired with the 2012 Bodegas Re "Chardonnoir". The salad was pretty standard, but the Humitas required some tamale making skills, as well as experimenting with the consistency of the filling. The couple who were responsible for this course watched a few youtube.com videos to hone their assembly techniques. Additionally, they were able to find Aji pepper paste at a local Mexican grocery store, to keep this dish authentic. The wine pairing was interesting, in that the wine was a blend of Chardonnay and Pinot Noir (not unusual for sparkling wine, but this was a still wine). It had a pink/orange hue to it, and was fairly high in acid, and medium body. On the nose, there were aromas of stone fruit, tangerine, and minerals. Again, a very nice pairing. The main course was my responsibility, as the host. Since I don’t have an open pit fire, I resorted to a barbecue to make Cordero a la Parilla con Merquen y salsa menta (Grilled Merquen Lamb skewers with mint salsa). With this, I served Papas Rostizadas (roasted multi-colored fingerling potatoes). The lamb marinated for about two hours in a yogurt and merquen sauce. I was able to find the traditional Merquen pepper mix online, and it is worth finding. The lamb was put on skewers alternating with peaches and bay leaves, and slowly grilled, then served with a mint salsa. The fingerling potatoes were simply roasted with garlic and rosemary. With this course, I had two different red wines (I bought both while in Chile): 2011 Errazuriz Don Maximiano and 2008 Casa Silva Carménère Microterroir. Both wines are wonderful examples of what Chile can do. The Errazuriz was their founder’s reserve, and is mainly Cabernet Sauvignon, and has the typical Cab notes you would expect: cassis, currant black pepper, and clove, along with firm tannins. In hindsight, I wish I had held this longer, as I think it was still too young. The Carménère, on the other hand was perfect with the lamb. It was a powerful wine with sweet soft tannins. On the nose, black cherry and spice, with a long finish. The final course was a dessert course, and this couple had more of a challenge, as the recipe really didn’t exist. We had Tarta de Fruta con Quinoa soplada (Fruit tart with puffed Quinoa) along with Helado de rica-rica (rica-rica ice cream). After some searching, we found puffed quinoa to make the tart crust. The crust was then lined with a layer of chocolate, and filled with custard and fruit. The tart was served with “rica-rica” ice cream. I put the “rica-rica” in quotation marks, because it is impossible to find this herb outside of Chile (if anyone finds it, let me know where). We tried to recreate the flavor of rica-rica by combining rosemary, mint, sage and lemon zest. An unusual ice cream flavor, but it worked. With this course, we made Vaina, a blended drink consisting of Ruby Port, Cognac, Crème de Cacao, eggs, powdered sugar and ice, then topped with cinnamon. These go down too smoothly, so be careful! There you have it, a four course Chilean dinner, including wine, for only $50/person. And, a fun evening with friends and fine food, made with your own hands. If you want any of the recipes, let me know in the comments section below.